On-Demand Password is a tokenless approach to providing two-factor authentication without the requirement for users to carry a physical one-time password generator - a hardware token. When a user is trying to access an application secured by two-factor authentication, the user will receive an one-time password generated by the authentication server and delivered to the user via a specified communication channel such as SMS text message, email or voice call. 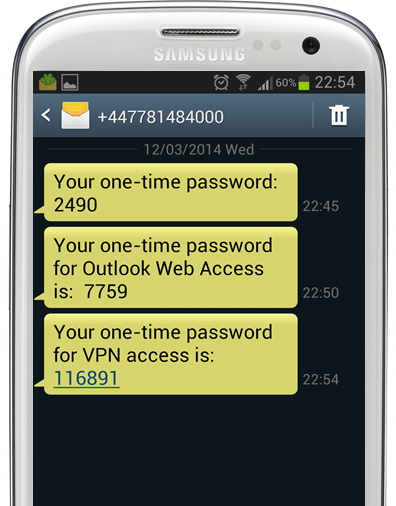 T-Pass is an on-demand, one-time password authentication solution that delivers passwords to your phones via Text message, Telephone call, Twitter direct message or Email messages. GridGo is an on-demand, on-screen security grid that is delivered to the user’s logon screen in real time.